EMC consulting and training firm. Solved or prevented hundreds of problems for numerous industries – computer, medical, military, industrial, telecomm, facilities, and more. Trained over 10,000 students through public and in-house EMC seminars. Full time consultants since 1987. 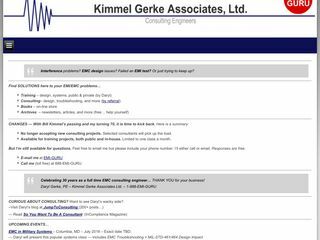 Note – Bill Kimmel passed away in 2015 – now focused on EMC training. Please contact Daryl Gerke for info.